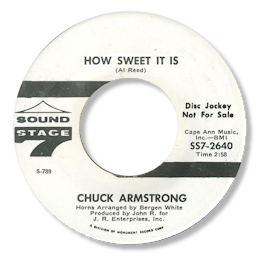 One of the most travelled of all the classic soulmen, Chuck Armstrong seems to have recorded music all over the US – and fine music it was too, mostly from his own pen. 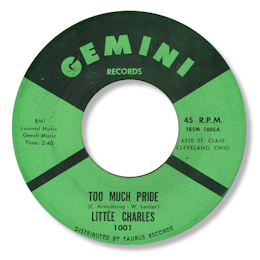 He started out in Cleveland as “Little Charles” for the local Gemini label. The mid paced beater “Too Much Pride” showed he had a good range to his voice and a lovely gospel tone to his phrasing. Perhaps there were too many other artists calling themselves “Little Charles” – like Charles Whitworth for example – but for whatever reason from then on he used his real name. He showed up next working with John Richbourg in Nashville who released a couple of 45s on him. The best known of these is the melodic How Sweet It Is for which I have a soft spot. Great guitar and full rich horns help of course but it is Armstrong’s well-modulated performance that grabs me the most. His second SS7 45 was produced by the highly talented Bob Wilson. The unissued toe tapper “Why Does It Hurt So Bad” is very listenable as well. Chuck popped up next in Detroit with a 45 on Black Rock. A Better Place is a sumptuous ballad set in a typical Motor Town ocean of strings, girl chorus and tasty piano. Over all this Chuck can be heard (just about) with another full-on vocal. This was produced by the Chicago based George McGregor with whom he co-wrote the song. By the following year he was in Miami, recording for Betty Wright’s husband King Sporty. “Black Foxy Woman” was pretty ordinary to be honest but when Action brought it out in the UK they put a fine version of Jimmy Holiday’s “God Bless The Children” on the flip rather than the instrumental to the funk side. Armstrong’s cut was almost as good as the Heptones’ one. 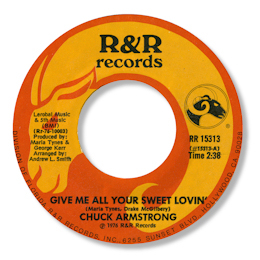 In 1974 Chuck appeared on the REW label out of Chicago with a good double sided single. 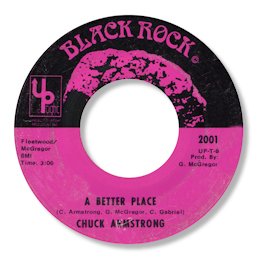 “I’m A Lonely Man” was the better song , and Armstrong came through strongly despite poor production values, and a lack of sweetening on the track. This was produced by Robert Reese who was also at the helm for his R & R 45. The bouncy “She Had The Right” was the pick of the sides, but sadly low QC (or lack of money) on the disc meant that the out of tune horns were retained rather than re-recorded. Both sides were recut on Armstrong’s only LP, called “Shackin’ Up” which came out on R & R in 1976, as was a new version of “Black Foxy Woman” entitled “Sweet Foxy Woman”. And there were no low productions here thankfully, as the tracks were recorded in New Jersey under the direction of the great George Kerr and Mari Tynes, with Mr Reese having the roles of “Album Concept” and "Executive Producer". The rarity of this set has meant that few people are aware of its qualities as a very solid set, no disco rubbish – unusual for its time, and featuring a couple of stand out cuts. The melodic toe tapper I’m Coming Home featured another full-on performance from Armstrong, as indeed did the pick of the tracks Give Me Your Sweet Loving. 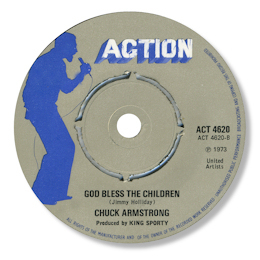 This was in effect a southern soul ballad thanks to the lead guitarist’s licks, the tasteful strings and horns, and Chuck’s gospel cadences. No wonder an edited version was the top side of the only 45 lifted from the album. By the end of the decade Chuck was back in Florida with King Sporty but sadly both of the tracks on Konduko are run of the mill disco, and his final 45 for Power Tower in Texas is even worse. So it was good to see Armstrong’s name on the writer credits for Oscar Toney Jr’s “Guilty Of Loving You” as this wonderful singer reprised Chuck’s “She Has The Right” and recorded a new song, the melodic beater “Something Tells Me”. UPDATE ~ Dante Carfagna has written:- "Producer Robert Reese was based in Miami and owned a few clubs down there. Reese also produced Bobby Williams and seemed to have Chicago connections. 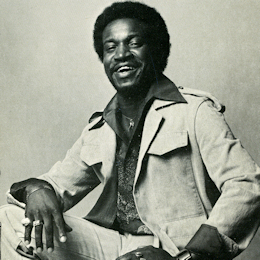 Top Hit started in Akron, Ohio by Herb James and Billy Pittman, but moved to Miami in the early 70s. Pittman went to Georgia, while James hooked up with Reese in south Florida. Pretty sure Chuck Armstrong was originally from Texas and spent most of his time in south Florida. Lots of ads for him in the black newspaper from 67-77 in Miami." I'm very grateful to Dante as always for sharing his knowledge. Note ~ the 7” version of the Konduko release has “Something got a hold on me” spread over two parts.